It is precision flying at low speed and a high angle of attack. It is the definitive skill that sets Navy carrier pilots (and Air Force exchange pilots who have flown with a Navy carrier squadron) apart from all others. It’s interesting to note that military uniforms have all sorts of badges and doodads to show that the wearer has qualified in this or that, but there is no doodad for carrier landings. They are included in the gold wings a naval aviator wears. It has been a very long time since I’ve made a carrier landing, and in the interim, carriers and aircraft have gotten bigger and more sophisticated. But the principle remains the same: Fly the plane aboard the ship at the slowest speed at which it can be done safely. Like any critical flying skill, it’s something that is practiced over and over until it becomes second nature. Here’s a secret about flying: When you start to learn something new, such as formation flying, instrument flying, gunnery, or dive-bombing, it’s hard, scary, and it seems like things happen way too fast, before you are ready. That’s why you practice. And practice and practice. Take dive-bombing. Back when I was learning to drop a bomb on a target (long before smart bombs) the routine was to roll into a 40-degree dive at 8,000 feet, place the center dot of the gunsight below the target, and let it walk up to the target so it is dead on just at the time to drop the bomb. That was at 3,300 feet. Drop the bomb and start a pull out at 4-5 Gs. OK. The first time I did it, all I cared about was knowing when I got to 3,300 feet so I could pull out. I’d heard stories about pilots having target fixation and flying into the ground. The dive, which actually took about 15 seconds, seemed to take no time at all. I’m not sure where the gunsight was in relation to the target. My focus was on a safe pull out. Time passed. We kept practicing. What I began to notice was that time seemed to slow down. The dive took longer in subjective time. I had time to look around, check my altitude, check the sight, and actually fly the plane into a better position before dropping the bomb, still at 3,300 feet, but no longer a panic point, simply the altitude to push the bomb button, and start a pull out. It was the same with carrier landings. Long before actually landing on a carrier, we practiced at an auxiliary landing field. We went over the routine again and again and again, getting comfortable with the procedure. As with dive-bombing, the first attempts were tense, scary, and flashed by much too quickly. Again, the immediate concern was doing it safely more than doing it well. But, as usual, there comes a time when things slow down and you “get ahead of the plane,” so you can make it do what you want, rather than just reacting to whatever is happening. Then out to the ship to do it for real. Make six OK landings and you’re qualified. This is what the landing pattern looks like. We enter the pattern astern of the ship, as shown on the right side of the diagram, and fly up the starboard side in a flight of four at 500 feet of altitude. The leader breaks to the left when well ahead of the ship, makes a 180-degree turn, and flies downwind. Each of the other aircraft do the same, maintaining a proper interval so that the deck will be clear of the previous plane by the time the next is ready to land. As I break, I pull off the power to slow down, drop the landing gear and tailhook, and begin the carrier landing check-off list. The goal is to have the plane set up properly when I reach the 180 or abeam position. As the speed drops, I put in full flaps and retrim the aircraft to fly at the slower speed. I adjust the engine controls so that they are properly set up for full power in case I have to take a wave-off and go around for another try. Flying downwind, I reach a position abeam the ship and report to the landing signal officer that I am at the 180, wheels, flaps, and hook down. I take off a little power and begin a turning descent. I am falling behind, relative to the ship, since I am still flying downwind while the ship is steaming upwind. As I approach the 90-degree position, I want to have my plane set up and trimmed to fly at the proper approach speed. This is a few knots above the speed at which the plane will stop flying and spin out of the air, which is the cause of almost all the tension in making a carrier landing. The hours spent making practice landings at the auxiliary field have made it, if not comfortable, at least no longer scary to fly this slow. To aid the landing pilot, the ship has an optical device that projects a beam of light toward the planes approaching to land. This is the glide path that I want to follow down to a safe touch down in the middle of the arresting gear. Other optical devices give an indication to the pilot that the plane is on the glide path above it or below it. I’ll intercept the glide path somewhere between the 90- and 45-degree positions. I’m now scanning between the landing area of the ship, the optical glide path, and my speed and altitude instruments in the cockpit so that I can continue to fly around the pattern safely and intercept the glide path at the right speed and altitude. When I see the optical ball that shows the glide path, I report that and continue turning and descending until I enter final approach directly behind the ship. At this point I may get some instructions from the LSO to fine tune that last stage, telling me if I’m a little high, a little low, a little fast, a little slow, or so on. I’m about 100 feet above the water and 50-100 yards behind the ship, still descending. As I roll the wings level, the rate of descent slows and I fly right up to the stern, crossing over the flight deck and flying down until my tailhook catches one of the arresting gear wires. The wire is attached to an arresting gear engine, which pays out wire under tension to slow my plane from the flying speed at which I caught the wire to a full stop. Assuming all was successful, the plane bounces to a stop. I get a signal to put on my brakes, then to lift the tailhook, lift my flaps, and then to release brakes and taxi forward to clear the landing area so the next pilot can land. I’ll also get the signal to fold my wings, which Navy planes do so they don’t take up so much parking space. I’m directed to a parking space, given the signal to kill the engine, and the flight is over. 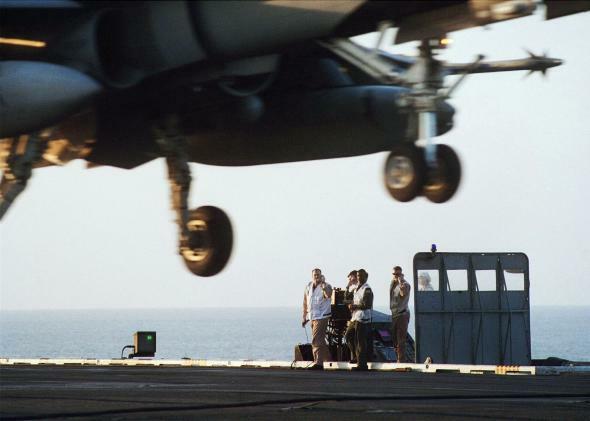 A U.S. Navy landing signal officer helps land an F/A-18 Hornet strike fighter in 2001 on the USS Theodore Roosevelt. I’ve made this sound routine, because, when we are flying every day, it is. 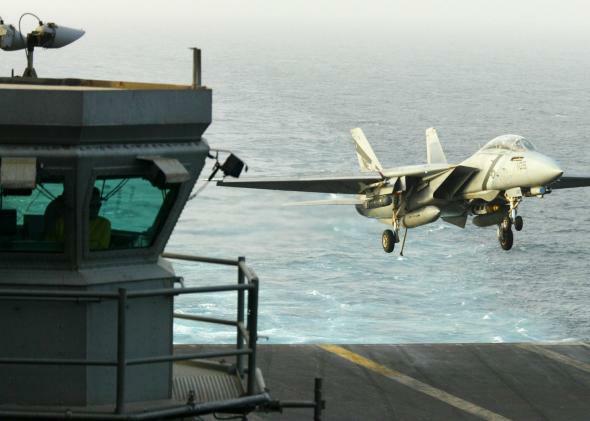 Making a carrier landing is just the way a Navy pilot at sea finishes a flight. If we haven’t been flying for awhile, or if the weather is bad, or there are heavy seas causing the deck to pitch, then it’s less than routine. If the plane is coming back from combat (something I have never experienced) and may have battle damage or a hung bomb or rocket, that’s another tension-maker. But there are a lot of people there to help. For instance, there’s a guy with binoculars whose only job is to make sure that your landing gear, flaps, and tailhook are all down as you said they were and that the plane is not visibly damaged. There’s another who is keeping track of your speed and reporting to the LSO if you are faster or slower than you should be. Usually the LSO already knows this, because he knows how the plane looks and behaves when it is on the correct speed or slow or fast. And there’s the LSO, who is highly experienced at watching planes land on a carrier and watches each plane come aboard from the time it picks up the glide path until it lands. He is also the guy who can wave you off if things aren’t right. When I get a wave-off, I hope it’s because of a fouled deck, meaning there was something wrong in the landing area so I couldn’t land. But it also could have been because I was doing something wrong that would not result in a good landing or doing something dangerous that could result in my breaking the airplane and harming myself. So a wave-off is always taken seriously. If I get the wave-off signal, I add full power, slap my landing gear lever to the up position to reduce drag, and make a left turn out of the pattern, then straighten and fly along the port side of the ship, climbing to 500 feet, and bringing up the flaps once I have a proper speed. Then, I take interval in the pattern and try again. Then there are night carrier landings. Some pilots dislike them. I always rather enjoyed them. The reason is that in the dark, all the distractions are invisible, the landing area is picked out in lights, and you just watch the glide path and your instruments and fly right on in. If it’s dark and raining, that can be scary because visibility is reduced. I wrote in my Quora profile that I was a Navy carrier pilot “when I was young and foolish.” That wasn’t lightly said. I enjoyed every minute of it, even those minutes when I realized I had just gotten out of a situation in which I might have been killed. Especially those minutes. What I didn’t realize at the time, and didn’t realize until much later, is how much I still had to learn to be the best of the best. I ended my naval career before I reached that point for the very mundane reason that marriage and a child had put an end to my desire to go to sea for six months at a time. Actually, it didn’t put an end to that. I still would have enjoyed going to sea. What I wouldn’t have enjoyed was being separated from my wife and kids for that long. So I got out after seven years active duty, spent a few more years flying in the reserves, and hung up my flight suit for good. Military Aircraft:What are the most culturally significant airplanes? Military: What famous actors served in the military? Aircraft Carriers: What does it mean for a US carrier to be maintaining fleet readiness? Correction, May 20, 2014: Due to a photo provider error, the caption for the top image originally misidentified the F-14 as an F/A-18 Hornet.